Blue Suede News #39: Johnny Burnette, Rocky Burnette, Elmore James, High Noon, Sean Mencher, Fred Carter, the doors, Rockabilly, blues, '50s Rock'n'Roll! Issue #39 - Summer 1997 - Scroll down to order!! 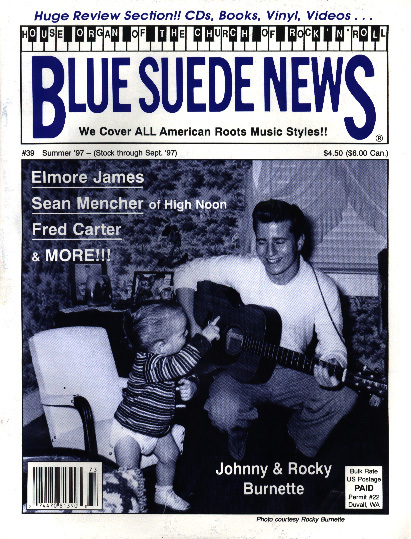 Blue Suede News #39 contains many feature articles, among them a cover story on Rocky Burnette, son of legendary Rock'n'Roll Trio member and later teen idol Johnny Burnette. Interesting interview and cool photos! There is an extensive story on Elmore James, Blues master with a crying guitar. Also an interview with Sean Mencher of High Noon fame, one of the '90s most influen'cial authentic Rockabilly trio's out of Texas. In the '70s bands like Red Knuckles and the Trailblazers opened up the pathway for alt. and traditional Country acts to follow and there is an article about this here. Fred Carter played with Elvis Presley, Ronnie Hawkins, Conway Twitty, Eddie Cochran, Roy Orbison ­ here is the story about this obscure artist, the Louisiana hepcat. Beyond the Doors is lengthy movie review about the famous Doors. Send $8.00 (U.S. or $9 Canada), or $11.00 (Outside the U.S. and Canada) and note which issue you're buying - to Blue Suede News, Box 25, Duvall, WA 98019-0025 U.S.A.